Chat Heads on Android is great because they're there across the entire OS, no matter what app you're in or Web page you're looking at. But on iOS? Functionality is restricted, further highlighting the closed nature of Apple's ecosystem. 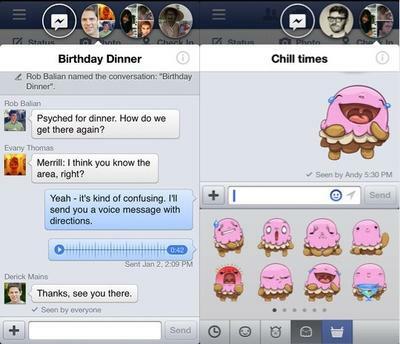 But thanks to developer Adam Bell, Chat Heads for iOS is no longer confined. Through a Jailbreak tweak, Bell has opened up the guts of Chat Heads for iOS so they're present everywhere, just like in Android. The Verge has a hands-on demonstrating how it looks, saying that, at the moment, not everything is working 100 percent. But keep in mind Chat Heads for iOS was just released, and having a more free experience this soon after release is a testament to Bell's skills. "The hardest part was getting [Chat Heads] to render on top of everything else," Bell said. By using his tweak, Facebook will be always running on your phone, but it has little effect on battery life, according to Bell. "It doesn't seem very resource intensive. Only when you move the Chat Head is it actually doing anything." Bell hopes that once everything is 100 percent in working order he can release the project for free on Cydia. He even hopes to find a way to integrate SMS and iMessage into Chat Heads, which Bell believes is a definite possibility. And, again, shows how much more fun an open environment can be on an Apple device, even if it takes the community, and not Apple, to do it. To see the tweak in action, head on over to the source link.